Let our holistic laser treatment for rosacea help you end the cycle of this frustrating disorder. Didn’t think it was possible to treat rosacea? Let us show you how it can be done, by working with you body’s own physiology and self-healing power! We know how difficult living with rosacea can be. Especially when you’ve probably tried many different treatments without success. At AMA Regenerative Medicine & Skincare, our goal is to eliminate your rosacea once and for all, by working with your body’s own physiology and self-healing power. 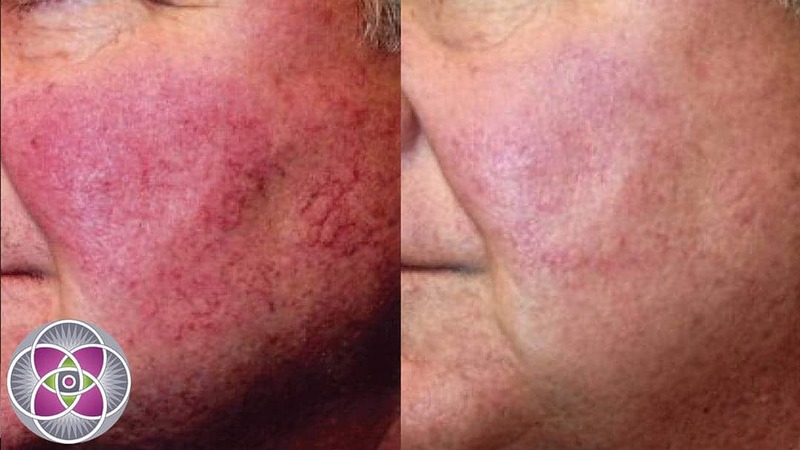 Through our holistic, multiple modality laser protocols, we can completely remove even the most severe rosacea and help you put a beautiful, rosacea-free face forward to the world once again. Rosacea is one of the most common causes of persistent skin redness of the cheeks and nose. The exact cause of rosacea is unknown, but it occurs most commonly in patients of Northern European descent with fair skin, and will often run in families. Rosacea is common in both men and women, although men are much more likely to develop the progressive disease, especially on the nose. Aside from rosacea that is associated with unhealthy intestinal bacteria, there are virtually no other causative conditions that have been identified as directly linked to rosacea. Thus, without a specific underlying cause to treat, we are left only with options of targeting the symptoms of the rosacea. The earliest signs of rosacea can be present even in childhood. Most patients are ‘blushers’ who easily flush when stressed, and may be especially sensitive to acne treatment medications or skincare products. In some patients, this tendency to blush and flush may progress to persistent redness and the appearance of broken capillaries on the cheeks and nose. The redness may deepen and other signs of inflammation may set in, including swelling and pimples, especially on the cheeks and nose (“gin blossom”). Rarely, chronic inflammation may lead to overgrowth of collagen and sebaceous (oil) glands in the skin on the nose, leading to rhinophyma (a rare disorder involving the thickening of the skin on the nose). In this case, a more intensive rosacea treatment may be required. Thickened bumpy skin that occasionally grows around the tip of the nose making it look bulbous (rhinophyma). To treat these symptoms, far and away the most effective therapy is laser treatment. Depending on how severe your rosacea is, a series of laser treatments are likely to be needed. Additionally, you are likely to achieve better results from protocols that utilize more than one type of laser. This is due to the fact that more severe cases of rosacea typically affect many different layers of your skin, each of which is best targeted by different types of lasers. For instance, a physician that uses a Long-Pulse Dye laser along with a YAG laser is likely to achieve significantly better results than using either one of those lasers by itself. AMA Regenerative Medicine & Skincare’s innovative treatment protocol for this inflammatory disorder incorporates all our holistic laser methods of effectively controlling and lessening the symptoms of the rosacea. This allows your skin can heal naturally from the inside out. We call this a “multiple-modality” use of lasers. More difficult acne rosacea treatments may require photodynamic therapy. Where many physicians fall short is that they focus solely on treating the vascular components of rosacea. As lasers are very target specific, specific types of lasers are very effective in removing all sorts of vascular lesions such as spider veins and broken capillaries. However, to heal skin that has been suffering from rosacea for a long time, repairing the upper collagen layers of the dermis is important to address. The collagen matrix within these layers will become damaged and weak due to the chronic inflammation associated with rosacea. As a result, the skin becomes uneven and bumpy, and is likely to prematurely age, sag and wrinkle. Therefore, as an adjunct to treating the vascular aspects of rosacea, it is advisable to integrate into the protocol lasers that stimulate the natural generation and remodeling of new collagen. Consequently, a strong and healthy collagen matrix will not only help keep rosacea from ever returning, the patient will enjoy smoother, tighter and more youthful skin. Q. I have a mild form of rosacea with severe flushing and blushing. Would this rosacea treatment decrease the vessel size as well as the visible permanent redness? A. By far, laser treatment for rosacea is the most effective medical treatment. When properly performed, laser treatment can remove the vasculature in the skin that is visible such as spider veins and broken capillaries. Laser treatment will also significantly reduce the flushing and blushing you are referring to. It is important to understand that rosacea is often times not just a problem of the surface layers of the skin (epithelium). It is often caused by weakness in the collagen layers deeper in the dermis of the skin as well. For treatment to be effective, lasers to treat the vasculature and lasers to strengthen the deeper collagen are needed. If the underlying collagen is not treated, the rosacea tends to return much more quickly. Q. My skin is dry, cracked, leathery and very red. Would IPL treatment work to get rid of my severe skin redness? Are there any side effects? A. Based on your description and without seeing you in person it is very hard to make a recommendation. However, typically, IPL treatments by themselves are not very effective as a treatment for rosacea. A fractional C02 laser will likely give you much better results. As far as side effects, if the practitioner has assessed your skin properly and used the correct settings for the laser, it is very rare to have any negative side effects. Q. I suffer from Seborrhoeic Dermatitis. Can this treatment get rid of the red bumps under my skin? A. About Seborrhoeic Dermatitis: The exact cause of this condition is also not known and may involve everything from yeast infections to immune system issues, and thus every case may require different treatment. However, it can be successfully treated. We have found that a combination of specific laser treatments along with naturopathic modalities such as ozonated topical ointments and specific herbal supplements are very effective. Your best option is to come in for evaluation and possible test treatments to determine which protocol will work best for you. Q. Is it possible that this rosacea treatment will aggravate the rosacea and make it worse? 1. The surface layer of the skin where the redness is showing up (epithelium). Removing the excess blood vessels in this layer will make the redness go away. 2. Often rosacea is also associated with a weak collagen matrix in the dermis underneath the epithelium. Thus, laser treatments that strengthen this layer of collagen will help keep rosacea from recurring for the long term. Both of these laser treatments can occur during the same visit to our office, and with a bit of topical anesthetic, they are not painful. Your face will be sunburn red for a few days after each treatment. We have successfully treated thousands of patients with varying degrees of rosacea.